The global digital music market has continuously expanded since 2008. The market share of digital music has risen by 22 percent (US$ 4.2bn) in 2008 to 57 percent (US$ 5.8bn) in 2012. In the same period the physical music market lost nearly a third of its volume (IFPI 2013: 7). The divers of the digital music market are not music downloads anymore, but revenues from streaming services, which grew by 62 percent (on US$ basis) from 2011 to 2012 according to the current IFPI report (2013: 24). Music streaming revenue, thus, account for 13 percent of the global digital music market. However, the relevance of the music streaming market differs from country to country, which can be particularly highlighted for the US, Germany and Sweden. After the three case studies, the economic relevance of music streaming services is analysed for those countries included in the current Recording Industry in Numbers report of IFPI (2013). The Recording Industry Association of America (RIAA) reported that in 2011 the digital music sales of US$ 3.56bn outperformed the physical sales of US$ 3,38bn for the first time by 51.3 to 48.7 percent – without considering revenues from performance and synchronisation rights. In 2012 the digital music sales increased by further 14 percent to US$ 4,05bn while physical sales decreased by 16.5 percent to US$ 2,82bn. In total the recorded music sales dropped by 0.9 percent from 2011 to 2012. If the downside trend continues in the next few years – minus 18.5 percent on average in the past 5 years – the physical sales would drop to US$ 1.53bn in 2015. The digital music sales have to grow by a quarter to US$ 5.37bn to compensate for the sales loss of the physical product. This simple projection to 2015 should be considered with caution. It holds only true if the decrease in physical sales neither slows down nor accelerates. In addition we have consider that the composition of the digital music sales has fundamentally changed in past few years. When RIAA reported digital music sales for the first time in 2004 their growth was driven by master tones and ringback tones. In the following years mobile music sales mainly accounted for the increase of the digital US music market from 2005 to 2008, when the mobile music segment peaked at US$ 977.1m. Since then, however, mobile music sales has dramatically lost ground and decreased by 82.9 percent to US$ 166.9m in 2012, which accounts for a digital market share of just 4.1 percent. The most important drivers of digital music sales were music downloads from platforms such as iTunes and Amazon Music Store. Hereby we have to distinguish between single track and album downloads. Single track downloads accounted for the highest share of 40.1 percent (US$ 1.62bn) in the digital music market. Digital album sales lag behind with a 29.8 percent share and sales of US$ 1.20bn. The average album sales growth of 28.9 percent nevertheless outperforms the single track sales – with an annual growth rate of 19.2 percent – in the past six years. Despite this growth of digital album sales significantly more CDs (210.9m units) were shipped in 2012 than digital albums (116.7m units). Although sales still increase in absolute figures, the growth rates of album and single track downloads started to decrease in the last two years. This indicates that the downloaded music market enters the stage of maturity. Music streaming business models, therefore, play a more important role in such a changing industry environment. The sales share of subscription and streaming services in the digital music market was 25.5 percent in 2012. This share also includes ad supported as well as subscription revenues, but also licensing payments of Internet radios and webcasters to digital collecting society SoundExchange, which channels them to the right holders. SoundExchange paid US$ 462.0m to the labels and musicians in 2012. The direct payments of interactive streaming service such as Spotify and rdio account for another US$ 570.8m. In total interactive and non-interactive webcasters contributed US$ 1.03bn to the digital music market in the US, which is less than the digital album sales. However, the music streaming segment grew by 58.6 percent on a year to year basis. If the access model should outperform the ownership model of music the US streaming market has to grow significantly in the near future to compensate for the expected sales drop in the physical product. There is the potential for further growth if we consider the fast growing market for tablets and smart phones as well as the ongoing improvement of broadband mobile Internet access. On the other hand, however, it’s a big issue for streaming services to convert users of freemium models to paying subscribers. At the end this rate of conversion will be decisive if streaming will grow at a sufficient rate or not to compensate for the loss in the physical segment. Whatever happened, it can be taken for granted that the phonographic market in the US won’t accomplish the sales volumes for recorded music of the millennium. Since then the US recorded music market has shrunk by 52.9 percent from US$ 14.58bn to US$ 6.87bn in 2012. The German market for recorded music is characterized by a relatively high share of 79.5 percent of the physical product compared to other markets. In 2012, the physical sales accounted for EUR 1.41bn compared to EUR 294m of digital sales. The digital transformation of the German market, thus, is less far than in the US, in the UK and in France. However, the sales drop of 21.0 percent has been less dramatic in German since 2003 than in other markets. Despite considerable growth the digital market in Germany lags behind other markets. The single and album download sales were the backbone of this growth. The digital album sales of EUR 144m were dominant and accounted for half of the digital music sales in Germany in 2012. 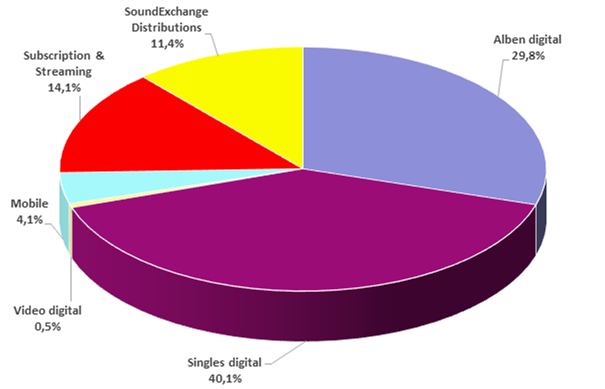 In contrast, single track downloads were at EUR 109.0m, which resulted in a digital music market share of 37.2 percent. The German music streaming market has still potential to grow. National streaming services such as simfy.de had problems to gain a broad user base in the past. Spotify, however, operates in Germany since March 2012 and, thus, its revenues are not fully included in the year’s end statistics. In 2012, the subscription and ad-supported offerings generated revenues of EUR 36m, which accounted for 12.3 percent of the digital music market. Compared to 2011, the streaming revenue increased by 38.5 percent. In total, streaming revenue accounted for just 2.5 percent of the recorded music market, whereas online and mobile music downloads generated a share of 18.0 percent. (BMVI 2013: 10). With a share of 70.8 percent the CD sales are still dominant. This underpins the assumption that the digital transformation of the German recorded music market is still in its early stage. It has to be questioned if the streaming and download revenues can compensate for the loss in physical sales in the near future. A study by GfK market research (BMVI 2013: 14), however, concludes that record sales will account for 53.6% and digital sales for 46.4 percent of the total market in 2016. GfK predicts a further considerable growth of the download market to nearly a third, whereas subscription services such as Spotify, Simfy, Nuke etc. will contribute 10.9 percent. The rest of 2.1 percent will be generated by ad-supported offerings and upfront payments to the right holders. This four years’ forecast seems to be conservative in the current period of dramatic change. Music access models have developed much faster in other countries than expected as the Swedish example highlights. The Swedish phonographic market (valued in wholesale prices) has shrunk by 39.6 percent from SEK 1.83bn in 2001 to SEK 1.11bn in 2005. 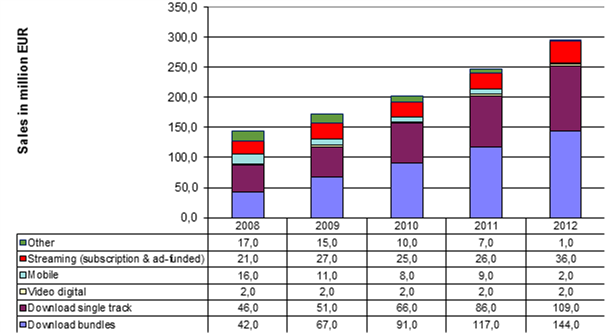 Digital music sales of SEK 22.5m were reported the first time in 2005. Single track downloads of SEK 22.5m accounted for half of the digital sales and 47.0 percent were mobile sales. Streaming services generated a comparable small revenue of SEK 1.2m in the same year. Three years later CD sales fell to SEK 790m, whereas digital sales increased to SEK 71.2m. The download sales dominated the digital market segment with a share of 59 percent and mobile sales (ringtones, ringback tone etc.) with 23 percent. The share of streaming revenue, however, increased to 16 percent of the overall digital music sales. 2009 was dominated by public controversy about The Pirate Bay case. In mid of April the founders were found guilty for copyright infringement. They were sentenced to a year in prison and have pay a high compensation for damages to the copyright holders. Shortly before the EU Intellectual Property Rights Enforcement Directive (IPRED) was introduced in Sweden. The Swedish Wire reported a drop in the overall Internet traffic by 30 percent the day after the law was introduced. If we consider a 50-75 percent share of file sharing in the Internet traffic, we can suspect that the drop was caused by lower level of file sharing activity. The Stockholm based music streaming company Spotify AB benefited from the Pirate Bay incident. From the beginning, Spotify defined itself as the legal alternative to file sharing. This was the best PR message in a period of international media coverage of the Pirate Bay story. In August 2009, The Swedish Wire reported that Swedish record labels earned higher income from Spotify than from iTunes. In 2009, however, the revenue from ad-supported and subscription offerings accounted for more than 50 percent of the digital music market and for 15 percent of the overall recorded music market. (IFPI 2013: 58). The download sales, in contrast, dropped to a 42 percent share of the digital market segment. This trend continued in the following years. In 2010, the download segment accounted for 22 percent of the digital music market. In 2011, it decreased further to 16 percent and in 2012 it was just 9 percent. In contrast the music streaming revenue increased from year to year. In 2010, music streaming accounted for 66 percent of the digital music market. In 2011, the market share increased to 82 percent and eventually in peaked at 91 percent in 2012. Thus, SEK 641 Mio. (US$ 94.6 Mio.) of SEK 704 Mio. (US$ 103.9 Mio.) were contributed by streaming services to the digital market. Sweden is, therefore, the by far best developed music streaming market worldwide. Due to the breath-taking growth of the streaming music market, Sweden became the 8th largest digital music market in the world. The Swedish case provides good evidence that a quick transformation from a record to a digital market can increase to overall market volume. 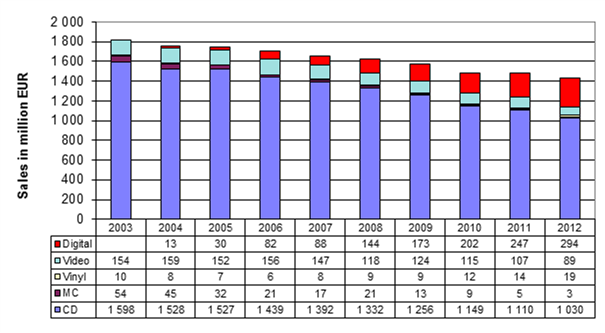 The Swedish phonographic market has grown by remarkable 26.9 percent since 2008 – 18.7 percent alone from 2011 to 2012. 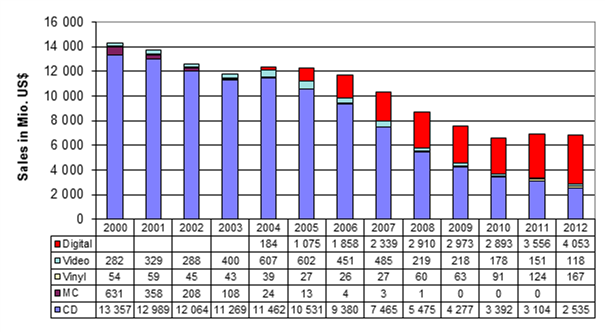 Nevertheless the Swedish recorded music sales are still lower by a third compared to 2001. The US, German and Swedish case studies highlight that the digital transformation is in different stages in different countries. Whereas in Sweden the transformation to a digital music market has already taken place, the US is in the midst of the process and German just at the beginning. An international comparison of different music markets based of IFPI data (IFPI 2013) underpins the assumption of various degrees of digital transformation in different countries. The transformation has taken place in markets with a digital market share of more than 50 percent. China is the front runner with a digital share of 82 percent, but with a still high piracy rate. India follows with 60 percent in front of Sweden (59 percent), the US (58 percent), Norway (57 percent), Thailand (57 percent), Ecuador (54 percent) and Paraguay (54 percent). On the way to a digitized music market are countries with a digital share beyond the international average of 35 percent but lower than 50 percent, such as Australia (47 percent), Denmark (46 percent), Canada (43 percent), South Korea (43 percent), Ireland (40 percent) Malaysia (40 percent), UK (39 percent), New Zealand (36 percent) and Mexico (35 percent). The next group of countries have a digital share slightly below average: Singapore (33 percent), Switzerland (32 percent), the Philippines (31 percent) and Columbia (30 percent). The largest group are countries with a digital share in the overall recorded music market between 20 and 29 percent: Taiwan (28 percent), Brazil (27 percent), Italy (27 percent), the Netherlands (27 percent), Spain (27 percent), Hong Kong (27 percent), France (23 percent), Chile (23 percent), Finland (22 percent), Portugal (22 percent) and Austria (21 percent). A digital music share that is well below average can be found in countries with digital markets that account for 10 to 20 percent of the recorded music sales: Germany (19 percent), Peru (19 percent), Belgium (18 percent), Japan (17 percent), Bulgaria (16 percent), Czech Republic (14 percent), Turkey (12 percent), Indonesia (12 percent), Argentina (12 percent) Slovakia (11 percent) and Hungary (10 percent). Finally we can identify a group a country with an under developed digital music market with a share of less than 10 percent: Poland (9 percent), South Africa (8 percent), Venezuela (6 percent), Uruguay (5 percent) and Croatia (4 percent). In comparing the different countries neither market volume nor the geographical location of a market seem to determine the degree of digitization. Whereas the US-market, the largest recorded music market in the world, has a considerable high digital market share, the second largest market in Japan lags behind with a digital share of 17 percent. Since the physical product still dominates the Japanese recorded music market, Japan overtook the US as the largest market for CDs and other physical formats. In Europe, the large French and UK recorded music markets are at least on the way to digitization whereas the German market lags behind. A clear trend to digitization can only be observed for the Scandinavian countries – Sweden, Norway, Denmark with Finland lagging behind. Eastern European music markets on the other hand have less digitized music markets. In Asia we find a mixed picture. Some countries – China, India, Thailand – have fully digitized music market, whereas other countries such as Japan, Taiwan and Indonesia are still at the beginning of the digitization process. In Latin America relatively small markets such as in Ecuador and Paraguay are highly digitized, whereas Brazil, Chile, Venezuela and Uruguay have very low digital market shares. It is, therefore, striking that a high digital rate does not necessarily correlate with a high revenue share of music streaming. 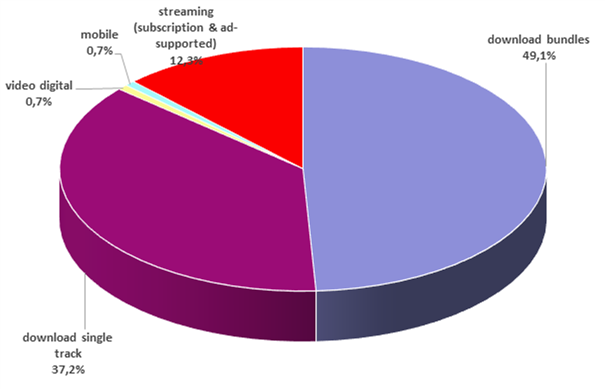 The RIN report of IFPI (IFPI 2013) provides a good overview of the relevance of subscription and ad-supported revenue from streaming services. (Fig. 8). We can identify nine different groups of countries. Sweden is a category by itself with a subscription revenue share of 91 percent in the digital music market in 2012. Sweden is, therefore, the second largest music streaming market worldwide – behind the US – with a sales volume of US$ 94.55. Norway and Finland are the other two Scandinavian countries in global top streaming markets with a streaming share of 74 percent and 70 percent respectively. With a sales volume of US$ 50.10 Norway has an “over-dimensioned” streaming market compared to the small number of inhabitants of 5 million. Therefore, Norway is the sixth largest music streaming market worldwide. Norway is close behind South Korea, which had the exactly same streaming share of 74 percent as Norway. Taiwan and Hong Kong complete the list of countries with a streaming share well beyond 70 percent. The second category consists of countries with a streaming market share of more than 50 percent but lower than 70 percent. Among them we can find several Eastern European countries – Poland (63 percent), Bulgaria (60 percent), Slovakia (58 percent), Czech Republic (54 percent) and Hungary (50 percent). However, two Western European countries are also included in this category: Spain with a streaming share of 52 percent and the Netherlands with 54 percent. Turkey (68 percent), Brazil (53 percent), China (52 percent) and India (49 percent) have also a relatively high music streaming shares. It is striking the only a few countries have an average streaming share of about 50 percent or slightly less: Denmark (47 percent), Portugal (45 percent), France (40 percent) and Argentina (34 percent). It seems that the global music streaming market is divided in countries with a high – more than 50 percent – streaming share and in those countries with a share pretty below 30 percent such as Italy (29 percent), Singapore (27 percent), Thailand (25 percent), Mexico (19 percent) and Belgium (18 percent). Thailand is further a good example for a market with a high digital but low streaming share. Canada, Australia, Malaysia and the US are in the same situation. The US has the largest streaming market worldwide, but it accounts for just 8 percent of the digital music market according to IFPI numbers. Likewise in the UK the revenue from subscription based models account for just 12 percent of the overall digital music sales despite a high number of music streaming services. The digital transformation of music markets is much more complex than a simple format shift such as from vinyl records to CD in the 1980s. The digital music markets are very dynamic. In the Netherlands for example, subscription models did not play an essential role in 2010, whereas ad-supported freemium offerings accounted for 17 percent of the digital sales – apart from single track download with a share of 49 percent and album download with 25 percent. A year later, however, the ad-supported revenue exploded to a 35 percent share and the subscription revenue became visible for the first time with a 5 percent share. In the 2012 the subscription revenue rocketed to a 28 percent share and equals the single track download sales. Digital album sales lag behind with a modest share of 12 percent in the overall digital music market. A similar dynamic can be observed for other countries. This indicates that the user behaviour has not stabilized yet and the change from an ownership to an access model is an erratic one. Thus, in Switzerland we can observe a regressive tendency (IFPI 2013: 59). Whereas in 2009 and 2010 subscription services contributed 12 percent to the digital music sales, in 2012 they disappeared from the market. In contrast, single track downloads increased to an all-time high of 51 percent – if we consider correct IFPI data. And there is not automatism that music consumers has to be motivated by freemium models to pay for subscription services later. In Spain (IFPI 2013: 57) the subscription share was 27 percent in 2010 and even 36 percent a year later. In 2012, however, the subscription revenue share fell to 24 percent in favour of ad-supported services, which accounted for a 39 percent share in the digital music market. The reason might be that new offerings cannibalise or grow faster than existing ones. Thus, there is no clear trend in the digitization of the phonographic markets. Some markets are dominated by the download business such as in Germany, UK and the US, whereas in other markets the penetration rate of streaming models is remarkable high such as in Sweden, Norway and South Korea. And in other countries such in the Czech Republic, Spain and China the revenue from ad-supported services are predominant. Thus, it is not easy to predict the future of the digital music market especially when it comes to music streaming. Billboard.biz, IFPI Digital Music Report 2013: Global Recorded Music Revenues Climb for First Time Since 1999, February 26, 2013 (accessed on April 30, 2013). 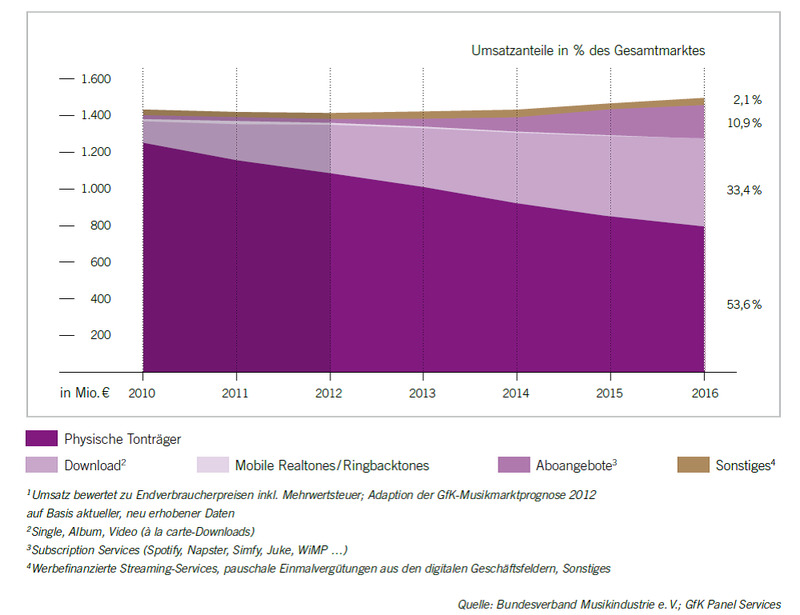 Bundesverband Musikindustrie, 2013, Musikindustrie in Zahlen 2012. Berlin. 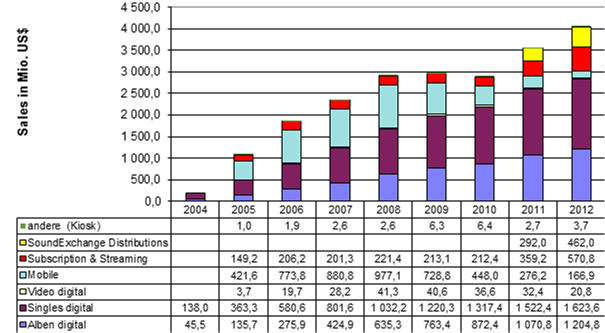 International Federation of the Phonographic Industry (IFPI), 2013, Recording Industry in Numbers 2012. London. New York Times, “Court Says File-Sharing Site Violated Copyright”, April 18, 2009 (accessed May 3, 2013). Recording Industry Association of America (RIAA), “So What Exactly Is A Shipment?”, July 9, 2009 (accessed April 30, 2013). The Swedish Wire, “Swedish crackdown on piracy reduces file-sharing”, August 4, 2009 (accessed May 3, 2013). The Swedish Wire, “Spotify overtakes Apple’s iTunes”, August 10, 2009 (accessed May 3, 2013). RIAA reports “shipment” sales of its member labels to the retailers. Since stores can return unsold merchandise, RIAA subtracts returns so the final data is a net figure. For digital products sales and shipments are virtually the same thing, since no returns exists (see RIAA-webpage). Directive 2004/48/EC (Enforcement of Intellectual Property Rights). By comparing IFPI data with date provided by national industry bodies, remarkable differences can be observed, especially for the US. Whereas RIAA reported US$ 570.9m from “subscription & streaming” with additional US$ 462.0m payments from SoundExchange, the current IFPI Recording Industry in Numbers reported just US$ 207.9m of revenue for subscription. The difference of US$ 800m has to be explained. The IFPI-RIN only reports revenue from music subscription but does not include ad-supported revenue in the US and UK. For the US further 12 percent of digital music sales are summarized in the “other” category. We can assume that ad-supported income can be found there.